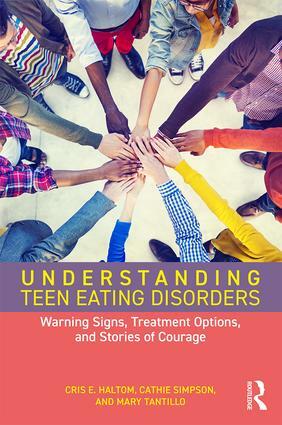 Understanding Teen Eating Disorders: Warning Signs, Treatment Options, and Stories of Courage by Cris E. Haltom, Ph.D., CEDS, Cathie Simpson, Ph.D. and Mary Tantillo, Ph.D., P.M.H.C.N.S.-B.C., F.A.E.D., C.G.P. Understanding Teen Eating Disorders introduces readers to common teen eating disorder scenarios, their warning signs, and treatment options. Each chapter examines a teen or tween and brings the factors, whether they be environmental, genetic, co-existing conditions, etc. that contribute to his or her eating disorder, to life, while seamlessly integrating the latest research in gene inheritance, brain chemistry, and eating disorders in accessible, reader-friendly language. Each chapter provides treatment options, including outpatient, group therapy, and in-patient programs, for both the young person and the family. Each also ends with a Q & A section that reflects the concerns a parent, loved one, or treatment professional may have. Cris E. Haltom is a Certified Eating Disorders Specialist who has treated eating disorders in her private practice in Ithaca, NY, for over 30 years. She has presented eating disorder training workshops at national and local conferences. She is past Education and Prevention Liaison of the Western New York Comprehensive Care Centers for Eating Disorders and she authored A Stranger at the Table: Dealing with Your Child’s Eating Disorder (2004, Ronjon Publishing). She published research on her co-authored eating disorder education program, the Parent Partner Program TM. In addition to her clinical psychology practice, she is a Lecturer at Ithaca College in the Department of Psychology. Cathie Simpson lives and works in Ithaca, NY, where she is a psychotherapist and editor. Her interests are diverse. She coauthored the book American Dresses 1780-1900 with Elsie Frost McMurry (2001, Cornell University) and published the book Remembering Infancy: Adult Memories of the First Months of Life (2014, Scholars’ Press). Once a month, she facilitates the local pet-loss group. Mary Tantillo is a fellow of the Academy for Eating Disorders, Professor of Clinical Nursing at the University of Rochester School of Nursing, and Clinical Professor in the Department of Psychiatry at the University of Rochester School of Medicine and Dentistry. She has directed the Western NY Comprehensive Care Center for Eating Disorders since 2005 and founded The Healing Connection Inc. in 2010. Dr. Tantillo has treated eating disorders across all levels of care for over thirty years. She has presented and published research and clinical work on a relational/motivational approach to eating disorder treatment with a special focus on the use of Multifamily Therapy Group.